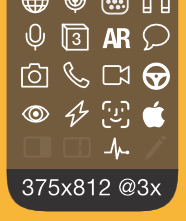 Here comes a substantial update to the iOS Support Matrix: I’ve added the iPhone 8, 8 Plus, iPhone X, ARKit compatibility and the screen sizes and display resolutions for all devices. The latter is something I’ve been missing ever since the 4.7″ and 5.5″ devices with their odd pixel dimensions came out. The new displays of this years iPad Pro and iPhone X made things worse, so I finally squeezed in a new row for display size. I chose to specify the size in points because I think that is the most important unit for developers. The resolution modifier (@2x, @3x) is there, too. (By the way: If you want to know more about iPhone screen sizes and the weird downsampling going on in the Plus models, check this great guide). There are also new icons for Face ID, Touch ID and ARKit support. To make room for these, I had to drop the icon for peer-to-peer connectivity. But I guess no one will miss it since this ages old feature is supported by every device since the iPhone 3G. I’ve got requests for a Metal support icon, but eventually left it out to save space. All 64-bit devices support Metal, so basically “ARM64” = Metal support. I hope you find this useful and please report any errors or suggestions in the comments! The iOS Support Matrix gets wider and wider. With the three new iPads that came out this year we now have 36 different iOS devices . More than half of them (19) are 64-bit now and will all support iOS 11. And that’s without the upcoming new iPhones. When the first iOS 11-only device comes out this fall, iOS 10 will have supported all new devices for four years, just like iOS 9 did. This pattern will definitely not change with iOS 11 as the beta already runs on every device released since 2014. Actually, if you buy a top-of-the-line model, this support period is five years. Only “reissues” like the iPad mini and the iPhone 5C, that were released with last years processors, got “only” four years of updates. That’s pretty cool! As always, please report any errors in the comments! Well, the title says it all. I didn’t find the time yet to come up with a new layout and icons for the new features (like “no headphone jack” ). But I guess the most important thing here are the new device identifiers and which devices stopped being supported by iOS 10, and that’s all included. As always, please let me know in the comments if you find any errors or have suggestions for the next update! There is also a more compact version of this matrix available, from the authors of the original version (get it at iossupportmatrix.com). I just still prefer this old layout because of all the details like identifier strings and the feature matrix, even if the file is now almost too big to view it on my 27″ monitor.